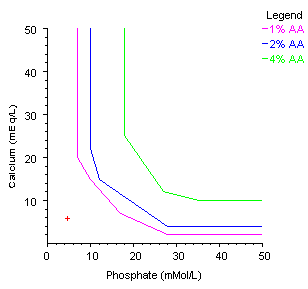 Each curve represents the maximum solubility of calcium and phosphate for a specific amino acid concentration. The red "+" represents the Calcium and Phosphate concentrations of the current TPN formula. The TPN is unsafe if the red "+" lies to the right of the solubility curve for the current amino acid concentration. In the following example, the TPN is safe at all Amino Acid concentrations because the red "+" lies to the left of all three curves.